Concert Review: Aubrey and Three Migos Live! I don’t know what you were doing Saturday, November 10, but I was among a crowd of 18,000 at Enterprise Center as the Aubrey and the Three Migos Live! Tour rolled through and gave fans a show they soon won’t forget. After opening act Roy Woods hyped the crowd up, it was nothing but a party until Drake ended the show with an unforgettable performance of “God’s Plan,” accompanied by an array of pyrotechnics, fireworks, confetti cannons showering down among most the crowd, and a fantastically delivered speech about the importance of acceptance, diversity, and the electricity that is present when music brings people together. ​Migos took the stage as a co-headlining act and the crowd greeted them with screams, yells, lit up cellphone screens, and shouting the lyrics to their favorite Migos hits, such as “Slippery” and “T-Shirt.” It was quite an experience to see the entire crowd of Enterprise Center jumping in unison, with people of all ages dancing and rapping their favorite lyrics while Quavo, Offset, and Takeoff used the entire stage, complimenting each other’s verses with support and hype. ​After a short set, Migos exited the stage and it was cleared off to reveal nothing but the rectangular platform performance space. Upon seeing this, I was wondering why they were clearing off the stage – as it is unusual for high-quality and big production shows to use little to no props. I soon realized that no standing props were needed, for Drake and his production crew had many tricks up their sleeve to wow and excite the audience. Rather it be an army of tiny drones floating above the stage giving the illusion Drake was performing under moving stars, a yellow sportscar being hovered above the inhabitants of the pit, or the stage being turned into a screen, creating the image that drake was performing on top of a swimming pool – it’s a fair statement to stay the production quality of this tour was top-notch. 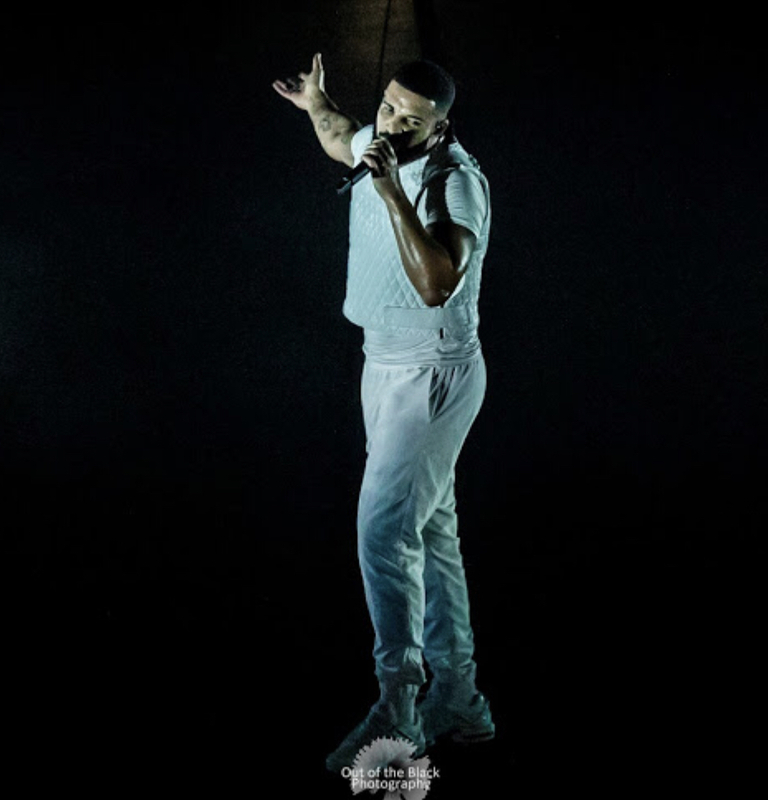 ​In between rap hits, Drake was nothing but humble as he thanked Saint Louis for always being such a loud and supportive crowd and reminiscing about his first time touring in the city with Lil Wayne. He then payed homage to this memory by performing a mash-up non-stop remix of songs spanning back over 10 years of his career such as “Free Smoke,” Trophies,” “Headlines,” “HYFR,” and “The Motto.” In between each hit, he asked Saint Louis if they wanted more. The obvious answer was yes, as it seems the crowd wasn’t ready for the show to end. ​The concert continued to such a high energy, as Migos then rejoined Drake on-stage to perform together, igniting the audience with their cover of “Walk It Talk It.” Migos then performed an additional set finishing up their stage time with “Bad and Boujee,” to which I think the audience was singing louder than the trio themselves! This high energy continued when Drake retook the stage and added some impressive back up dancers, giving a fan an opportunity to win $25,750 during a basketball shootout, as well as playing the left and right sides of the arena against each other to see who could out-perform the other side to hits “Jumpman” and “Both.” Not going to lie, the right side totally killed it. ​From the moment of entering Enterprise Center, to the moment of walking back out into the cold, November weather, there was not a moment of calmness. These 18,000 fans were so excited, and their excitement and enthusiasm was extremely infectious. Just when you thought Saint Louis couldn’t get any louder, Drake proved that he was up to the task by delivering an incredible performance, start to finish. Let me just say, next time he rolls though town, do yourself a favor, and purchase a ticket quickly!